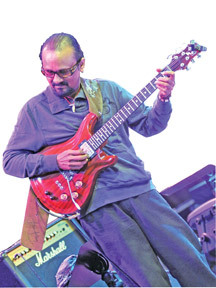 'Share the Love' an open air concert organized by Sadaham Sevana Trust to promote peace, rebuilding and solidarity was performed in the gracious presence of First Lady Shiranthi Rajapaksa at the Waters Edge recently. The founder of Sadaham Sevan Trust Ven Athuraliya Rathana Thera had taken the initiative to launch the evening to raise funds to assist the displaced and underprivileged children in the North and East to pursue their educational activities. The atmospheric event was elaborated by musicians of Beautiful Mind Charity of Korea, Thellippalei sisters, outstanding Sri Lankan singers Victor Ratnayake, Amarasiri Peris, Deepika Priyadarshani Peiris and Dinesh Subasinghe. 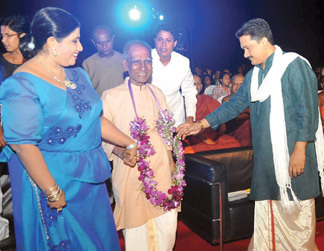 Veteran musician Pandith W D Amaradeva also graced the occasion. The music combined contemporary forms with ethnic music both Sri Lankan and Korean giving the audience an evening of splendid experience. 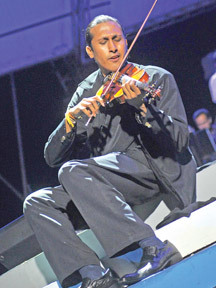 Dinesh Subasinghe performed with his violin, music which thrilled the expectations of the audience and the performance from the Korean musicians was not second best. The event in another way was also an exchange of Korean culture with Sri Lanka. Violinists, pianists, cellists, flutists and drummers in both countries made the maiden cultural music festival a memorable event. In his welcome speech Ven Rathana Thera said that music makes the rigid man soft and more sensitive to social issues which in turn are a way of looking into one's heart more humanly. He further stressed the importance of blending the technology, music and talent to enhance the lives of others who are underprivileged. The philanthropic group from Korea showed how repertoire of Western and Korean classical music could carry the message of love with their universal language. Music professor at Nazarene University Korea, who is visually impaired not only did spellbound the audience with his clarinet but also gave the message that nothing is impossible if one has the willpower. Defence Secretary Gotabaya Rajapaksa, several Cabinet ministers, Korean, Indian, Chinese diplomats, Heads of the three Forces and renowned artistes also witnessed the event.